One of my favorite things to do over the weekend in the summer months is to hit the local farmers market and stop by farm stands. This past weekend K and I did some early morning shopping at the local farmers market and I could not help but buy way too many strawberries. As you can imagine, I've been making strawberry smoothies and K has been having strawberries every morning in his cereal in an attempt to make a dent in the bounty of strawberries I brought home. On Monday night I decided to get a bit creative and make a strawberry salad. The best thing about this salad is that it is incredibly easy to make. Even the dressing which I think might have been my favorite part of the salad! Start by making the dressing. Chop 6 or 7 strawberries into smaller pieces, fourths is fine because they will get mashed and then blended. Place the strawberries, balsamic vinegar and brown sugar into a small saucepan and cook/ simmer the mixture on low for 10 to 15 minutes. Mash the strawberries a little as the mixture cooks. You should be able to stick a spoon into the mixture and it be coated but not sticky. If it's sticky add a little water, maybe a 1/2 tablespoon. Set the mixture aside to cool for 10 minutes. Once the mixture has cooled a little throw it into a blender and blend until you have a vinaigrette consistency, liquid. Set aside in a small bowl to cool some more. The next step is chopping the rest of the strawberries lengthwise, into this, heart shaped bits. Once you finish chopping it's time to cook the steak. While the steak cooks (mine took 8 minutes on each side) you can assemble the salad by pouring one tablespoon of dressing onto the greens at time, mixing in between spoonfuls. 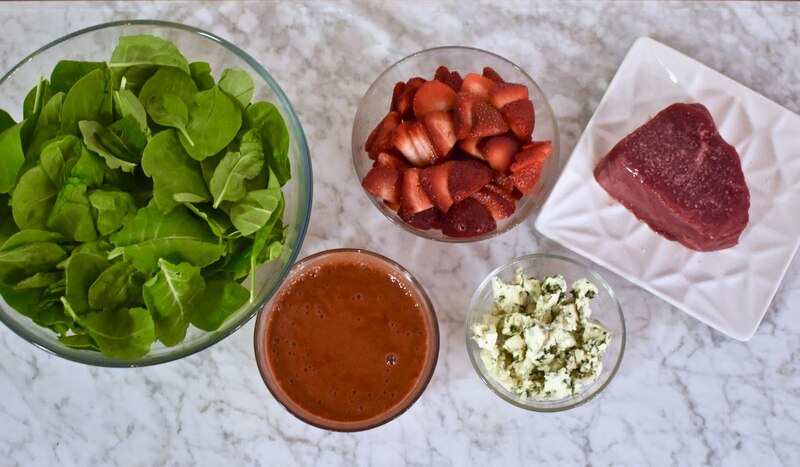 Do the same with most of the blue cheese and then with most of the the strawberries. Add a large spoonful, mix and then add some more. 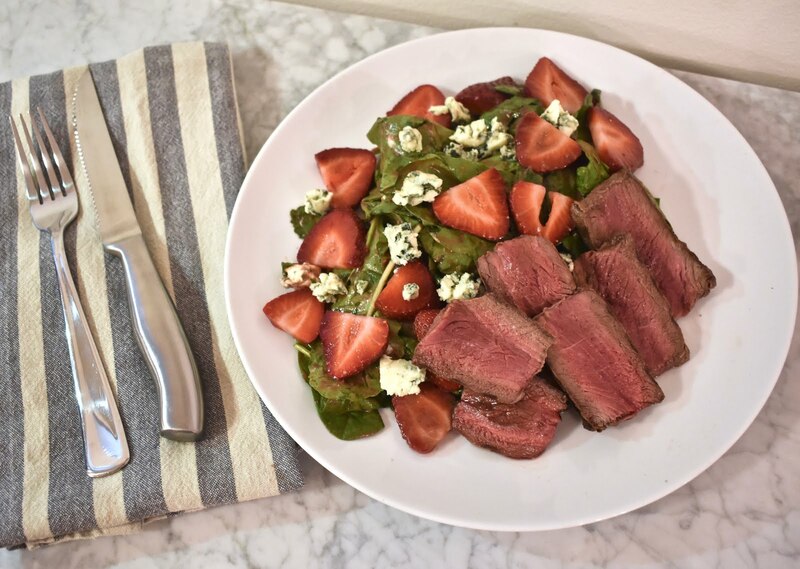 Leave a little left over blue cheese and strawberries to top of the salad and make it look extra pretty. Once the steak is full cooked, let it rest for 5 minutes before slicing and adding it to the salad. Top with the extra blue cheese and strawberries and you're done!